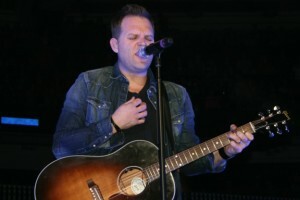 Matthew West has become one of Christian Music’s most popular songwriters and performers over the last few years and now is touring with the highly successful Christian music tour, Winter Jam, with some of the biggest Christian artists such as TobyMac, Red and Sidewalk Prophets. The Global Dispatch’s Brandon Jones spoke to West about Winter Jam 2013, making the new album and some of his fellow Christian artists. BRANDON JONES: Let me begin by thanking you for your time and letting you know how excited I am that I get to speak to you. BBJ: Well, let’s get right to Winter Jam, tell me what the experience has been like. 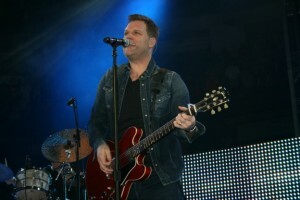 MATTHEW WEST: It’s incredible! There’s just constant high energy, it’s really cool. There have been huge crowds and there’s just something for everybody. BBJ: Is that the appeal…the different styles of music? WEST: I think that’s what makes it so unique. If you don’t like hard rock, they maybe you’ll like someone like myself. The diversity really draws a big crowd. BBJ: During the show you drop the really funny “Pee Your Pants” song, so is that a mainstay or just a one time thing? WEST: Yeah, I kinda make up songs…I think we try to look cool and people think we are, but we’re really just real people. The point is just don’t hold me up on a pedestal. BBJ: One of the themes you have in your show, part of your album is the 20,000 stories, how doen that inspire you? WEST: It’s an honor really…a responsibility. I’m so humble to hear people tell their stories through song. It really resonates and people are connected because they realize they are not the only one going through something. BBJ: My daughter’s favorite song on the new album (Into the Light) is track 9, “Waitin’ on a Miracle,” what’s the back story with this song. WEST: It’s about a soldier, on his third deployment to Afghanistan and he’s just counting down the days to get home to his wife and daughter. He’s truly waiting on his miracle. The family, the kids are waiting on their miracle to bring their Dad back. BBJ: Your vocal problems were the theme of the Nothing to Say documentary, do you still get feedback on that story…your story. WEST: I met a waitress in South Carolina…two days ago and she looked at me, tears in her eyes and said that ‘Really helped me through a tough time.’ That’s why it’s important to tell your story, it will connect with people. The good or the bad…it’s how God restores our lives and gives us hope. BBJ: You also had a bit acting in Heart of Christmas, working with Candace Cameron Bure (Kirk Cameron’s sister, DJ Tanner on Full House) so what do you learn from that experience? WEST: It was a real fun time and I’ve got another production in development. It’s based on Forgiveness, an inspired movie. It’ll probably be in 2014 and I’ll try to get in there and steal a few lines, but I’m not going to quit my day job. BBJ: I have end by telling you your daughters and they part on your songs, Delaney and Lulu have some fans in my house. BBJ: You just need to let them know we love it, so keep it up. WEST: Awesome! Dude, thanks for the kind words. BBJ: Thank you for your time. Get the Winter Jam tour schedule, catch a show near you.